Have been feeling a bit depressed, irritable and overwhelmed lately, truth be told. Haven’t You? The World is going to Hell in a Basket of Deplorables. The 2016 Armageddon Election that installed a Traitor, Brexit, terrorist attacks, the Parkland School and New Zealand Mosque Shootings, Putin, Xi, MBS, North Korea, Syria, Palestine, Yemen, South Sudan, Ukraine, Crimea invasions, bombings, floods, earthquakes, forest fires, teachers strikes, drone strikes, melting glaciers, doomed species, political gridlock and enmity, cancer, suicide, death and destruction: The list goes on and on and on…It’s in our faces 24/7/365. 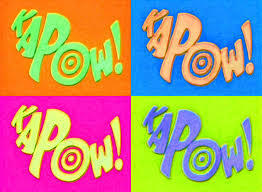 While listlessly draped on the sofa watching TV, quite by accident, flipped onto an old episode of Batman. Holy Bat Cave!!! Laughed so hard for the next half hour, at the beautiful uncomplicated silliness of it all, and also cried for the sheer joy of remembering a kinder, gentler time. As a kid, never ever missed a single original show, and the absurdly wonderful humor is even funnier today, than it was then. So many thoughts and memories: The Villains. Who can forget The Joker, Catwoman, The Penguin and The Riddler? Their dastardly evil plots were quite benign by today’s standards. The sheer joy with which Cesar Romero, Eartha Kitt, Julie Newmar, Burgess Meredith, Frank Gorshin and others played their roles, was not lost on us kids. No scenery was left unchewed, no cliché held sacred…KAPOW!!! The sets were absurdly simple and whimsical. Yes, they had a sense of whimsy without cutting-edge technology getting in the way. The props were hysterical. From the looks of the old TV episodes, it must have cost $50 to make a show, excluding actors salaries (which by today’s standards would be absurdly low). That includes costumes and make-up. The wonderful cheesieness of it all, enhanced the shared experience. WE HAD TO USE OUR IMAGINATIONS. Reminds me of the early Dr. Who and the TARDIS/Phone box from Britain’s BBC. The austere rough-hewn simplicity and boundless fun of its earlier incarnation was equally and wonderfully cheesy. These were after all, the same folks who brought us Bill and Ben the Flowerpot Men. The sheer darkness and introspection of what followed, the Big Screen versions of Batman and Robin, have to a large degree mirrored the ever darkening lens of world events. Early magical Super Heroes like Adam West and Burt Ward, have been supplanted by the likes of Michael Keaton, Christian Bale and Robert Downey Jr., worthy actors in their own right, commanding a larger, brooding stage. 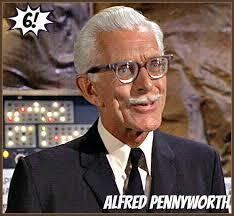 The witty repartee flew fast and furious with each Batman TV episode. Even as kids, we knew it was funny and as an adult, it is even funnier. 1. “It’s obvious. Only a criminal would disguise himself as a licensed, bonded guard yet callously park in front of a fire hydrant.” Donald Trump and Vladimir Putin need to be tied to fire hydrants and forced to watch old Batman TV episodes. 3. “A reporter’s lot is not easy, making exciting stories out of plain, average, ordinary people like Robin and me.” As Comrade Trump and Fox News never tire of telling us, media needs grist for its never-ending 24/7 mill. As Vladimir Putin’s minions at RT would tell you, hacking makes it a hell of a lot easier. 5. “Yes, he moves very quickly for an overstuffed and unlikely Egyptian Pharaoh” THIS is my new go-to description for Don the Con… with apologies to the late Victor Buono. 7. Batman “Catwoman, I find you to be odious, abhorrent, and insegrievious.” Don’t know about you, but I just adore that word insegrievious. Am going to make it my word of the month. And how anyone could find the delectable Julie Newmar odious, is beyond me. 9. “It is the duty of every good citizen of Gotham City to report meeting a man from Mars in a public park”. Will keep this in mind while watching jailbird George Papadopoulos lie his way through more TV interviews, or during the next wave of Border Patrol and ICE putting more Children In Cages in Trump Concentration Camps, as “illegal immigrants”. 10. “No, Robin. With my head sticking out of this neosaurus costume, I might not appear like an ordinary, run of the mill crime fighter.” Said Trumpanzee Alex Jones, to no one in particular – EVER. 11. .“Bartender, a bit of advice. Always inspect a jukebox carefully. These machines can be deadly.” This ad hominem always worked well for Brett Kavanaugh, and in various pubs in Northern Ireland. 12. “Let that be a lesson. In future, be more careful from who you accept free lemonade.” Dear Trumpanzees and Trump Base, Batman was speaking to you! 13. (after coming through Barbara’s window): “We would have entered the building by more conventional means, but we didn’t want to startle the tenants.” Am certain this was meant as a cautionary tale re Vladimir Putin and his army of Russian hackers. 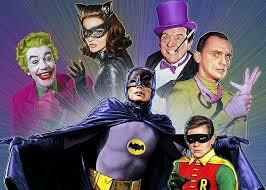 All thanks to the Original Guys in Tights, those fearless and pithy crime fighters, The Caped Crusader and Robin. They weren’t slick or technologically advanced. They just got the job done, and always saved the day. They brought us joy and laughter. Raising a dram to Adam West who will forever be my Batman, Burt Ward who played Robin, Alan Napier, who played Alfred Pennyworth, and the rest of the glorious cast of unforgettable characters, May the Road Always Rise Up to Meet You!